Just a little over one year ago (It was March 6th, 2010 to be exact) I married the most wonderful man ever. He makes all my dreams come true, and I thought I would share one of the little ones with you. 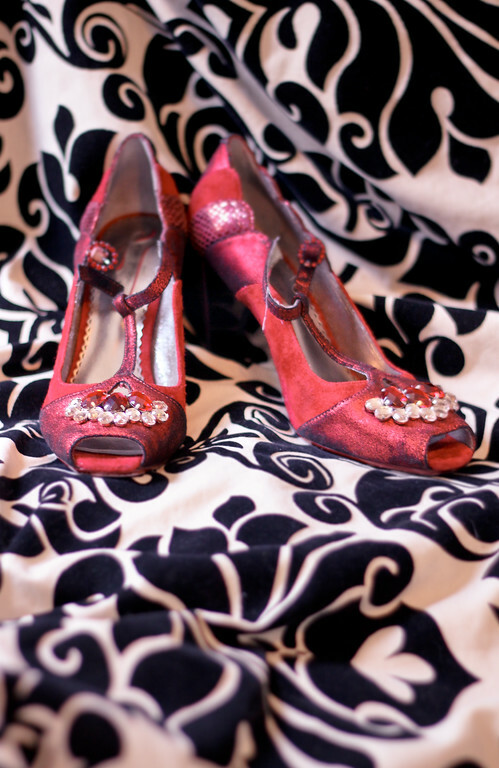 These were my wedding shoes. When I saw them I just knew I had to have them. No questions asked those were the shoes I had to wear on my wedding day. Only one little problem. They were WAY out of my budget. (They are probably the most expensive shoes I’ve ever owned) So, I bought another pair of sparkly red shoes and called it a day. Kenny thought otherwise… he order the shoes I really and surprised me with them!He’s so amazing! Anyways, here they are. They are pretty out there for wedding shoes, I know, I know. But that’s me.. kinda out there. haha! And it all went together I promise!